A chance encounter at a Yoga class for pregnant women brings together three very different ladies that become fast friends. Kelly Day, the woman who has it all, a perfect marriage, a picture perfect home and a job doing what she loves. But behind the scenes trouble is brewing in her home life and she’s finding that the balance between being a mom and being successful at her job is tougher than she ever imagined. Ayinde Towne is a wealthy and happily married to a basketball superstar. On the day of her delivery her husband comes to her side smelling like another woman’s perfume and the doubts begin. Rebecca Rothstein Rabinowitz is blissfully happy with her doctor husband and her job as a chef in an acclaimed restaurant. But her mother-in-law who’s been a thorn in her side since she showed up at Rebecca’s wedding in a wedding gown is moving from her home in Texas a little too close for comfort and Andrew doesn’t have the backbone to stand up to her. 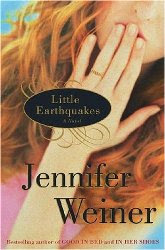 As their lives are shaken by these little earthquakes another mother, Lia Frederick, takes an unhealthy interest in Becky while dealing with her own tragedy. I really love the way the women find each other by the chance encounter and grow their relationship. When all looks doomed they have each other to lean on and get through the rough times. Reading this really made me value my close friendships even more. My review is based on the abridged audio narrated by the author who did an excellent job. She gave each character a different voice and personality which fit them perfectly. I enjoyed this quick read and recommend it to all chick-lit lovers. I think I've read this one but I really get all the Weiner books mixed up so I stopped reading them.